Served over ice in a salt-rimmed glass with a wide brim, a margarita is a Mexican beverage that can help you wash down your nachos, tacos or burritos. This drink, which has ingredients that include tequila and lime juice, is characterized by its green, white or yellow color. The caloric content of a margarita is higher than that of most other cocktails. 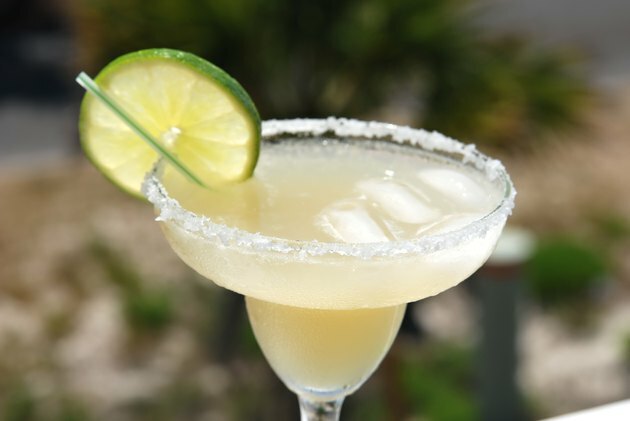 A 4-ounce margarita contains about 168 calories, according to the National Institute on Alcohol Abuse and Alcoholism. The institute's Rethinking Drinking website reports that, on average, margaritas contain more calories per serving size than martinis, cosmopolitans, daiquiris and mojitos. Among standard cocktails, only the pina colada -- at 490 calories per 9 ounces -- has a higher caloric content than the margarita. How Many Calories in a Caesar Alcoholic Drink?